I love Smash Bros. and I love Rhythm Heaven. As you might expect, I love this mash-up of the two franchises as well! Oh man, I wouldn't mind seeing all of these rhythm games turned into the real deal! Someone at Nintendo is working overtime when it comes to trademarks. Looks like the Big N wants to make sure they lock down trademarks for any/every game they've had throughout their history, and that continues with the latest batch today. Here's what Nintendo has filed trademark claims for recently. A few days back, our friend Jonathan Holmes put together a feature stating inside information on the Rhythm Heaven series. According to his sources, the series was being shelved altogether, which made many fans quite angry. Now Nintendo has been asked about the report, and they deny it completely. According to Nintendo's Yoshio Sakamoto, producer on multiple entries in the series, the franchise isn't dead. In a Eurogamer interview, Sakamoto very clearly states that the franchise isn't dead, no questions about it. Nintendo doesn't usually give out straightforward answers like this, which certainly makes me feel like the future of the franchise shouldn't be worried about. Our friend Jonathan Holmes is certainly in the know when it comes to some Nintendo topics. He has all sorts of connections, and I definitely trust his reports. That's why I'm so sad to read a recent feature he put together on Mother 3 and the Rhythm Heaven franchise. According to his inside source, things aren't looking good for either. 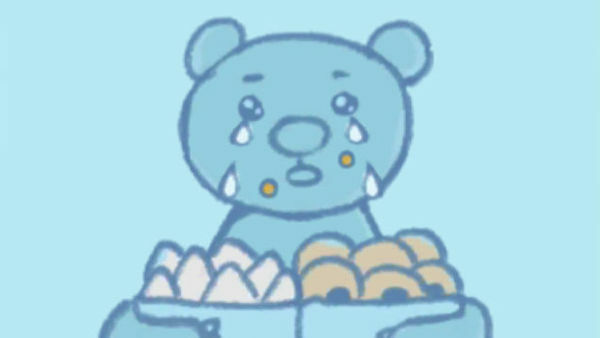 "You never know what's going to happen, but the way it looks right now, under Nintendo's current administration, Mother 3 will never leave Japan and there will never be another Rhythm Heaven game. Iwata was a driving force behind the Rhythm Heaven series, and a consistent advocate for NoA to at least look at the possibility of Mother 3 finding a new audience in the United States and Europe. With him gone, there is no one at Nintendo pushing for either anymore." Mother 3 not getting localized is a running gag now for a very long time, but it's disheartening to know we're not any closer to seeing the game released. As far as the Rhythm Heaven franchise goes, that's a real killer for me. I love rhythm games, and the series has been one of my favorites in Nintendo's library. That said, I recognize they're not big unit movers outside of Japan. I sincerely hope this report ends up being wrong, but I fear it's right on the money. 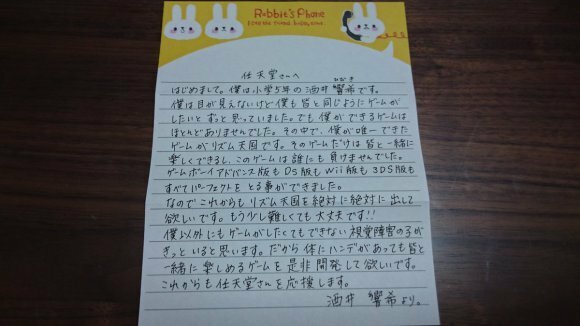 This is a pretty amazing story, and it all starts with a letter one fan sent to Nintendo. Hibiki Sakai is a 5th grader that loves Nintendo. He also happens to be blind. He's been that way since the age of 2, but that doesn't stop him from playing video games. In particular, he absolutely loves the Rhythm Heaven series, which is why he sent Nintendo the letter above. The translation can be found below. Eight days later, Nintendo sent a response to Hibiki. It wasn't just any response, though. 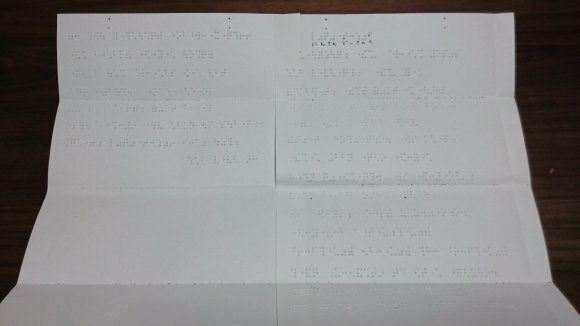 They took the time to write Hibiki in braille. One fan, one letter, and one very special response from Nintendo. Such an awesome thing to see. On-beat play and offbeat action! Perfect your rhythm with over 50 minigames and remixes in this quirky, charming rhythm game. 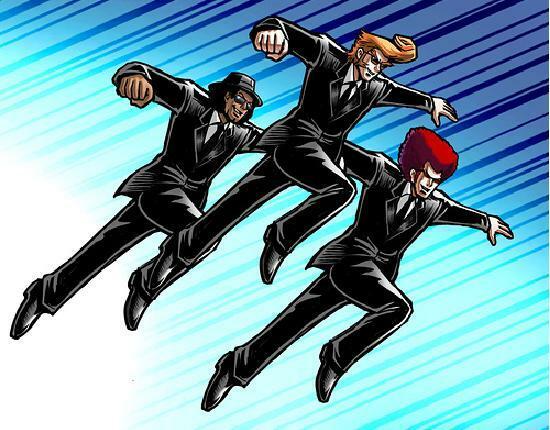 Catchy music and crazy scenarios will teach players to feel the beat. It's easy to learn, tough to master...but aim for accurate performances, as players will be rewarded with medals and bonus content! 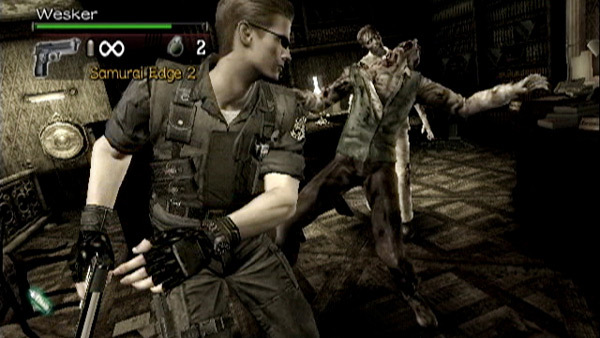 Uncover the backstory behind the fall of the Umbrella Corporation. Swarms of undead creatures and mutated terrors rule the streets, pestilent hordes born of Umbrella's botched biowarfare research. Gather your firepower, choose various routes and pathways, and prepare to face the horror as you uncover the dark truth that could take Umbrella down forever. Thanks to Mametchi for the heads up!